We all know that the brain processes and retains images better than the written word. Probably owing to the concept of evolution where we learned to observe even before we developed spoken or written languages. In such a scenario, visuals become a vital part of our life. And this is why most merchandisers rely on selling their products by primarily focusing on “product photography.” This holds true particularly for the largest target audience we have today: the millennials, who clearly prefer visual-centric platforms like Snapchat and Instagram. So it comes as no surprise that they feel very strongly about selfies and Insta-worthy pics because let’s face it (pun not intended), there’s something really joyful about posting that perfect pic on social media, right? But what about the photos that we witness day in and day out on e-commerce websites? How do we feel about them? It’s common fact that buyers are increasingly giving into their dose of guilty pleasure and opening at least one retail website a day. Think, that gorgeous dress on Myntra or those tan shoes on Flipkart that are on sale. Don’t you spend considerable time online window shopping and checking the product images? To corroborate this, here’s an interesting fact: According to a recent study by Salsify conducted for 9 million products, “product images” are considered to be the most vital criterion when it comes to encouraging buyers to buy products. In such a scenario, it is logical and makes business sense for e-commerce companies to ensure that their photography game is on point. You get the picture right? (pun intended). An obvious suggestion but an important one, the product photos should deliver clarity in terms of what the product looks like and display its USPs. For instance, what kind of colour options are available, the quality of material used with a zoomed to focus on the same, enlarged images of intricate designs on the product, etc. Additionally, websites should make sure that there are no unnecessary elements that take the focus away from the product - whether it’s text, graphics, or other props that are put in the frame. At the same time, the products should have a central theme that portrays a story and brings character to the product personality. This can be done by using a common colour theme or by using one prop that adds to the product’s perceived benefits. Flat, 2D like images will never catch eyeballs so you might as well put no pictures online. E-commerce websites should invest in a professional photographer who understands the importance of taking pictures from a deep depth-of-field, back to front. This will help provide a sharp image and make it look more appealing. After all, in the photography world, angles matter. Imagine you’re buying shoes and you only see the front of the shoe. Or you’re buying a bag from an e-commerce website, and the bag that doesn’t have a zip. As there are no top-angle pics, so you don't know. No points for guessing that the customer will probably want to return the product which will evidently lead to a great number of resources and effort going to waste. Not to mention, unnecessary logistic costs. So talking from a buyer’s point of view, the age-old mantra - “The more, the merrier,” stands true. Make sure to provide at least 3-4 images from diverse angles and ensure there’s good lighting across. So, to put it in layman terms, depending on the product, choose multiple angles that provide the customer all the information he/she needs. A lot of e-commerce websites don’t focus on this point as they’re always in a rush to get things up online. But the customer will do the exact opposite. The buyer likes to spend time with the product. Looking at every little detail to ensure they’re buying what feels “right” to them. So spend some more time shooting and displaying the minor intricacies that often go unseen but can make all the difference in terms of sale. Low quality, pixelated pictures are of no use to anyone. Providing high-resolution pictures made better with quality edits is key. Also, ensure there’s consistency in the look-and-feel of the product pictures to ensure brand credibility. If we were to summarize one key learning from this article, it would be this: Product photography is as essential to e-commerce websites as marketing is to sales. And the good news is that every organization can drive sales and ensure brand loyalty by way of clear and quality-driven product images. Generally, going the creative way helps but the top-priority should always be: quality, quality, and more quality. 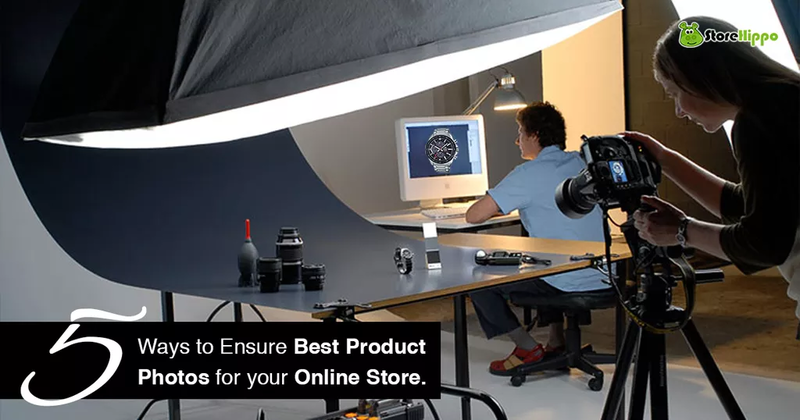 So get clicking and let your product photos do all the talking! And to help you along the way is our platform that supports your efforts. It’s not a secret that displaying a variety of images and diverse kinds of visual representation can make or break your game. This is where StoreHippo comes into play. It provides a drag-and-drop feature to help you design your e-commerce website themes and to present a 360-degree view of your products. Create your 14-day FREE trial store and explore the amazing features of StoreHippo e-commerce platform.